Wed Feb 23 Jamal and I attended the Soft Opening of Melody's totally rebuilt Purnama restaurant. Now known as Venue@the Moon, it will be open from 7am for breakfast, Lunch and dinner, then dance your socks off until dawn. Ines is a leap year baby. This year she celebrated her non-birthday at Café Warisan Bali on Feb 28. Norman of Mystique Hotel fame is off to Bangkok for a 2 week holiday and a Gourmet Thai cooking course. Rob & Wiwin head off for Bangkok and Yangon for a well earned holiday and rest. Wiwin plans a course in Burmese bead work. A recent photo from Ian & Mandy, Bendigo. They visited Bali last Sep. The price of petrol, diesel and kerosene has been subsidized in Indonesia since the Soeharto era. A political "hot potato" since Soeharto tried to increase the petrol price on orders from the Word Bank, resulting in his downfall. At that time petrol was around Aust. 10c per litre. Subsequent Indonesian governments nervously increased the price gradually until it became A$0. 27 per litre today. The Government have now announced a 29% increase from Mar1, to Rp 2,400, A$0.34 per litre, they say they will use the US$1.3B saved from the subsidy to assist the poor. Recently students have been protesting the rise in most major Indonesian cities. President Yudiono says the price hike will go ahead regardless. Coke bottles & wine flagons of Petrol for sale on the roadside. Imelda Fransisca of West Java is all smiles after being named Miss Indonesia 2005. She will now compete in the Miss ASEAN Pageant 2005. 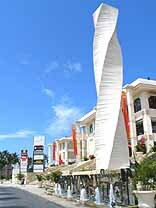 Just across from Waterbomb Park is the newly opened Discovery Shopping Mall in Jl Kartika Plaza. The centre is very impressive already complete with a Starbucks coffee shop, also many well known international retailers are there everything a tourist could want. The contentious US$25 Visa on Arrival (VoA) for tourists visiting Indonesia may be extended to include 11 more countries from the existing 21. One wonders if this is a cynical move following Immigration reports that during all of 2004 only US$35.6 million in fees were generated by the visa-on-arrival system, a figure substantially less than the US$50 million originally projected from the purchase of VoA. The new countries slated to be added are: Netherlands, Sweden, Russian Federation, People's Republic of China, Egypt, India, Spain, Saudi Arabia, Kuwait, Belgium & Portugal. The Bali Airport Immigration Office has announced that there are now 30 counters in operation at the airport, speeding up the VoA arrival formalities. Admirers and friends of Kadek Wiranatha - the owner of Air Paradise International gathered in force in Bali during the week of Feb 14, 2005, to wish both he and his airline the very best as they marked API's 2nd anniversary. When the inaugural flight to Perth took off in Feb 2003, sceptics predicting the imminent demise of Bali's first locally owned airline. The challenges of starting an airline just months after the tragic Oct 2002 Bali bombing seemed almost insurmountable. In 2004 more than 120,000 people flew his yellow-tailed airline between Bali and Australia. Earning friends and fans, and building air bridges between the world and Bali is what Pak Kadek obviously does best! Recently Bali's active volcano Gunung Agung started smoking, this has lead to huge activity by the Balinese who are madly painting their temples white to appease the god they believe resides in the mountain, in case he gets more angry and literally blows his top. caldera floor and the shores of Lake Batur in historical time. The first historically documented eruption of Batur was in 1804, and it has been frequently active ever since. Gunung Agung mountain is to the Balinese what Olympus was to the ancient Greeks -the Cosmic Mountain. The Balinese, who consider this volcano "the Navel of the World," always sleep with their heads toward Agung. The mystical Balinese believe the mountain was raised by the gods as a vantage point to view the unceasing pageant of life below. A major eruption in 1350 so fertilized the land around Besakih that year after year it has yielded enough rice to not only supply the needs of the complex but also defray the costs of the unending ceremonies staged in the mountain's honor. Agung's most recent eruption occurred in the closing years of the turbulent Sukarno regime, in 1963. The cataclysm began during the greatest of Balinese ceremonies, Eka Dasa Rudra, an exorcism of evil staged only once every 100 years. Except for minor activity in 1808 and 1843, this was the first time the sacred volcano had blown since 1350. Many people looked upon the disaster as a divine condemnation of the ill fated Sukarno regime, 1,600 people were killed and 86,000 left homeless. The Indonesian foreign ministry has confirmed that the Golden Jubilee celebrations Asian-African Summit in Jamal's home town of Bandung will not be affected by the Dec. 26 earthquake and tsunami. Built by Dutch Architect Van Galenlst. It is located at the corner of Braga and Asia Africa Street it became well known when the first conference of Asia Africa was held there in April, 1955. 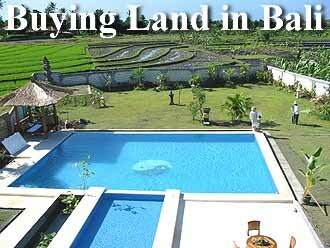 Buying land or a house in Bali has many pitfalls, not as easy as many real estate agents might tell you. 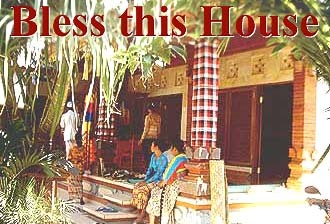 westerners who have returned to Bali to find their property sold by their trusty nominee. So in a word be damn careful and don't invest money you can't afford to loose. Hotels, malls and restaurants in Jakarta said on Sunday they were ready to comply with a bylaw banning smoking in all enclosed public places recently passed by the City Government. Jamal, Ines, Erna and John at Warung Italia waiting to savour the best pasta in town. Australia has updated a travel warning for Indonesia, saying new information suggests terror attacks could be mounted against foreigners taking part in tsunami relief efforts in northern Sumatra. Australians should defer non-essential travel to Indonesia as a whole, and should avoid all travel to Aceh and Maluku province, according to the travel advice issued on Saturday by the Department of Foreign Affairs. "We have recently received new information suggesting that terrorists may be planning attacks against foreigners involved in the tsunami relief effort in Aceh and other parts of northern Sumatra," the department said in a statement. Australia has about 1,000 military personnel in Indonesia as part of the tsunami aid effort. Cross strait ferry fee increases spark protests at Bali's eastern and western sea approaches. Effective February 1, 2005, passenger and cargo travelling between East Java (Ketapang) and Bali (Gilimanuk), or between Lombok (Lembar) and Bali (Padang Bai), the western and eastern approaches to Bali are paying more to make the journey. New fares are needed to cover rising fuel costs. A powerful 6.5 earthquake rocked Sulawesi island on Saturday, Feb 20, causing the sea tide to rise and sparking fears of another tsunami, meteorologists said. There was a report of the quake causing the tide to rise between three and four metres (10-13 feet) there were no reports of damage or casualties. The rising number of counterfeit banknotes and passports circulating in the country has prompted President Susilo Bambang Yudhoyono (SBY) to urge the authorities to get more serious in fighting document fraud. The Rp 100,000 (A$14.28) note features Soekarno and Hatta, the declarators of Indonesian independence in 1945. The writing in between the two is the "Declaration of Independence" paper signed by the two. Both subsequently became the country's first president and vice president. The note itself was the second issued in Indonesia and the first polymer to be used as business print notes. The notes themselves were printed by NPA (Note Printing Australia) although I have heard that some were also printed by a company in Thailand. I speculate that the earlier prints with the lower serial numbers were printed in Australia and the higher serials were printed in Thailand. 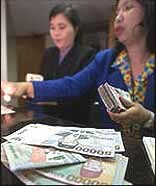 considering that the population of Bali is just 3.75 million, and the work force includes only 1.7 million people. This translates into an unemployment rate of 29%. Adding to the problem is the fact that many members of Bali's work force lack the necessary basic skills needed to undertake successful job application and the reluctance of the Balinese to be seen working in menial jobs. Feb 3: A MD-82 Lion Air aircraft arriving from Ambon, skidded of the end of the runway at Makassar airport. No one was injured in the incident and the 146 passengers as well as eight flight crew were safely evacuated from the airplane. Four months ago Pak Made of Warung Sobat demolished his house beside the now famous Balinese eatery, Warung Sobat. was summoned for the 2 hour house blessing ceremony attended by family, friends and neighbours on Saturday February 19. Pak Made plans to open an exclusive gift shop soon with handicrafts from Bali. One of the best kept secrets in Bali is the new Mystique Restaurant at Hotel Mystique in Jalan Petitenget, right opposite the Living Room restaurant. Owner Norman has decided that he wishes his restaurant to become known by word of mouth, rather than a whizz-bang opening, attracting every free loader in town who would never return. Power Blackouts are common in Bali. Everyday more tourist villas, shops, restaurants and hotels are added to the power grid placing more and more demands on the existing power supply. A power crisis is predicted for this year throughout Java and Bali. New power plants are being built in Java and due for completion soon. Bali has 3 generation plants and an undersea cable from Java connected to the Java grid. It is estimated this year Indonesia will need 23,000 Megawatts (MW) of power, which will be a shortfall of 4,392 MW. Indonesia being in a volcanic zone and on the "Pacific Ring of Fire" is placed perfectly to benefit from the production of geothermal power. Energy is provided for the generator by sinking 2 wells close together into the hot subterranean rock. Water is fed down one well and hot steam is expelled from the other, then the heat used to drive a turbine, in turn driving a generator, The system is completely clean and the water is recycled. 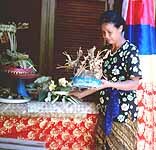 Many plants were planned thoughout Indonesia, but cancelled due to the Asian Financial Crisis. Now in Bali there are plans to go ahead with a new Geothermal Station in the Bedugul area. However many Balinese are currently protesting against the decision as they claim the station will desecrate their mountain areas. The KHO engineering department are now installing a new emergency power supply at the KHO to cover those annoying power failures. Many hotels and offices install and emergency generator, these are noisy and dirty. The KHO is installing an inverter system that runs from a normal inexpensive car battery. In normal mode the electric supplies the A/C outputs and the 12 volt car battery is charged. When there is a blackout the inverter changes to invert mode supplying 220 volt alternating current derived from the battery to the emergency lighting circuits throughout the house. With this system the normal power coming through the inverter is fine for operating the computer. However for the house emergency lighting we only need it to work when there is a blackout and best if it is automated. The solution a small transistorized relay circuit to automatically switch on the emergency lighting as soon as there is a mains power failure. The automatic relay circuit board was installed inside the inverter case. indicating a blackout, the relay would energize and the Emergency Lighting system activated. The rig was set up on a test basis to make sure everything was working and to determine the running times available from the 12 volt battery. most of today's "Pulse Power Supply" electronics, i.e. Tv's, computers etc. which are self regulating from 100-250 volts. Finally a new shelf was installed in the computer room and the Emergency power supply installed. The next task is to install emergency lighting through out the house and television. Already we have installed a 5 watt energy saver lamp in the lounge/dining area with a high efficiency reflector. Recently I have been reading a book on the race at the end of WWII to build an Atomic bomb. There were 6 years of research, experimentation and building before the bomb was used on Hiroshima in late 1945. Nearly 2 billion dollars were spent, on the Manhattan Project with Robert Oppenheimer at the head. in solving this dilemma by magnetically separating the two isotopes. The formulas for refining Uranium and putting together a working bomb were created and completed by some of the greatest minds of our time. At 5:29:45 on July 16th, 1945, in a white blaze the first atomic bomb ever tested lead in the Atomic Age. After many participants, signed petitions against loosing the monster they had created, but sadly in vein. We all know that an Atomic bomb works by the U-235 atom being split, then it continues on to split other atoms forming a chain reaction releasing a huge amount of power in a fraction of a second. How is the bomb detonated? A bullet of U-235 is fired into a package of U-235 at very high speed using TNT, which is detonated in the conventional manner by an altimeter. As soon as the bullet hits the U-235 package a chain reaction begins. How does the reaction stop? The bomb actually only uses about 7% of the U-235. The reaction ceases as the bomb blows it's self apart destroying the U-235 fuel. Aviator, movie producer, billionaire and hypochondriac, Howard Hughes was born Dec. 24, 1905, in Houston, Texas. His father who owned the Hughes Tool Company died in 1924 leaving his share of the business to Howard, when he turned age 21. Howard was 19 at the time and had a Houston Judge, a friend of his fathers, declare him an adult so he could immediately inherit his fathers wealth. Hughes and his Houston socialite wife, Ella Rice (married June 1, 1925, divorced in 1929) moved to Hollywood to make movies. At first he failed, then in 1928 he won an academy award for Two Arabian Nights followed by another in 1930.
for Hell's Angels, written and directed by Hughes and starring Jean Harlow, it was the most expensive movie of its time costing $3.8 million US dollars. In 1932, Hughes formed the Hughes Aircraft Company primarily to finance the expensive conversion of a military plane into a racing plane. On September 13, 1935, he set a new speed record, taking the H1 plane to 352 mph. Hughes won a military contract to build three "flying boats" for $18 million in three months. The terms proved impossible for Hughes. post-war Congress, he was called to Washington, to defend the plane and himself. On Nov 2, 1947, Hughes flew the aircraft at Long Beach, California, during a break in the hearings, and as legions of non-believers, who had dubbed the aircraft "The Spruce Goose," (even though it was made from birch) had to change their opinions regarding its ability to fly, Hughes was vindicated. The Spruce Goose never flew again. Hughes took responsibility for the aircraft and locked it in a special hangar with an extensive air-conditioned controlled environment. For years, the Goose was maintained almost as an active aircraft, its engines run up each month. After Hughes death in 1976 the aircraft was obtained by the California Aero Club and in 1982 it joined the graceful old ship Queen Mary at Long Beach, California. In 1983 John visited the Spruce Goose at Long Beach, California and spent the night on the Queen Mary, which at the time was operated as a Hyatt Hotel. 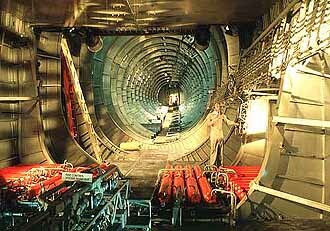 The overall size of the aircraft was amazing and being enclosed in the specially built dome made it appear even larger. Viewing the inside of the aircraft really bought home the massive size of the wooden structure. The 8, 28 cylinder aircraft piston engines powering the HK 1, were the largest ever built, each developing 3,000 horsepower. The Hughes HK1 (Spruce Goose) was the largest airplane ever built and still has a longer wingspan than the new double-deck Airbus 380 which will fly later this year. Designed as a cargo-type flying boat that would transport men and materials over long distances, the Goose was capable of carrying up to 750 troops, or 2 Sherman-class tanks. Its complex power boost systems gave the pilot the strength of a hundred men. Dismissed as impossible even by many of Hughes’ colleagues, it was decades ahead of its time. Its development shaped modern flight, solving tremendous design and engineering problems, testing new concepts for large-scale hulls and flying control surfaces, and revolutionizing jumbo flying bodies and large lift capability. In 1990 the Disney Corp. the owners of the Long Beach site decided to scrap the Spruce Goose. Fortunately it was saved by Evergreen International Aviation who gave the plane a new, permanent home in its to-be-built Air Venture Museum in McMinnville, Oregon, USA. The big move to Oregon. 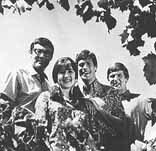 Another Special produced by Norm Spencer, directed by Michael Brayshay was The Seekers Down Under aimed at the Australian and UK markets. The show showed the seekers travelling all over Australia and doing their hit numbers. buzzing with excitement. The show was to be taped at the Princess Theatre, Melbourne where Miss Dietrich was performing in a season from Oct. 7 - 23. The stage show was produced and directed by Miss Dietrich, with arrangements by Burt Bacharac, lighting by Joe Davis and costumes bv Jean Louis. cameras were installed in positions to not detract from the live performance for the paying customers. Bruce Adderley was in charge of the sound, he and his assistants ran many cables to junction boxes for a split of the house microphones. From the OB van pictures were beamed by microwave link back to the Dorcas Street, studios. Backroom Will Have; The Laziest Gal In Town; When The World Was Young; Johnny; Go Away From My Window; White Grass; Boomerang Baby; La Vie En Rose; Lola; Frag Nicht Warum Ich Gehe; Lili Marlene; Where Have All The Flowers Gone; Falling In Love Again" to a standing ovation. After the show Miss Dietrich was invited back to the 7 studios to watch the replay of the rehearsal which channel 7 had taped. The idea being that suggestions could be made for improvement of the show before the final taping. little old grandmother and spoke with an American accent, not the German one we all know. direction of the show. She was quoted as screaming "Who the hell directed this" a voice said "I did, Miss Dietrich", she screamed "who the hell did you .... to get this job. Next morning Miss Dietrich's lawyers contacted the seven management announcing "Miss Dietrich has fulfilled her contract, which stated that the channel had the rights to tape one performance and one performance only." 10 years later where she performed at Her Majesties Theatre from Sep 1st - 13, 1975. She went on to a Sydney season, when on Oct 4, 1975 she fell. broke her hip and never performed again. She died in Paris on May 6, 1992 and was buried in home town Berlin. during World War II to entertaining Allied troops. Her major claim to fame during World War II was her work with the USO. There is no doubt that she made a major contribution to the morale of the troops. During the Africa and Italy campaigns, she withstood much privation in order to stay with the troops at the front, where she not only entertained but helped co-ordinate hospital and mess details. In the French & German campaigns, she often rode with General Patton at the front. Her vehement denouncement of the Nazi regime, and her participation in Radio broadcasts aimed at Germany got the desired result - she got under the skin of the Nazis. For her work, the U.S. and French governments awarded her many medals.